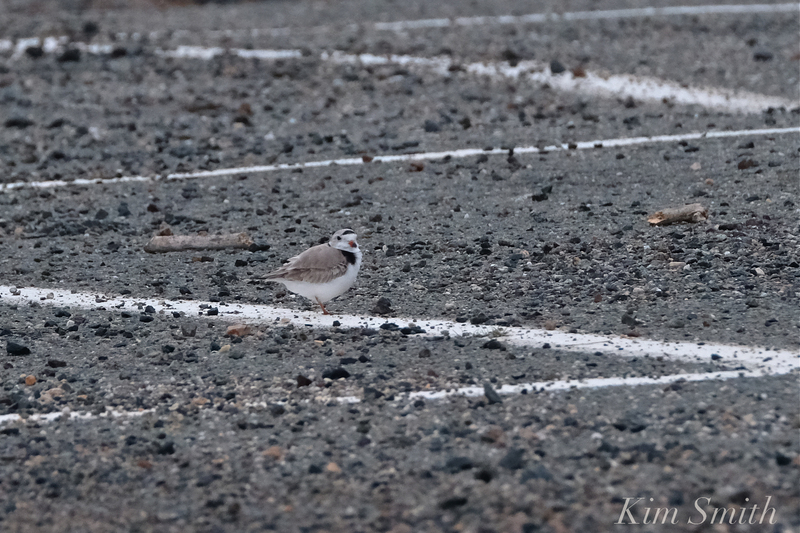 Our little Piping Plover family has for the second year in a row been shunted into the parking lot. Saturday morning at 7am they were seen courting and nest scraping on the beach. After a full morning of plenty of dogs off leash romping on the beach, they were nest scraping in the parking lot. By nightfall, they were mating in the parking lot. This behavior is precisely what happened last year. The PiPls would begin their morning courting and nest scraping on the beach but by the end of each warm April weekend day, especially off leash days, they were found courting and nest scraping in the parking lot. Sadly, there is a contingency that endlessly denies that the people not following the leash laws have any responsibility. They expertly spread misinformation and twist words around and this is not helping the Piping Plovers successfully nest and fledge chicks. It’s heartbreaking really because nesting in the parking lot very adversely affects the health of the parents and chicks for a whole host of reasons. The adults will be expending twice as much energy, guarding a nest scrape in both the parking lot and on the beach. Last year, the birds maintained their territory on the beach the entire time they were brooding eggs in the parking lot. Intelligently so, when you think about it, because the beach nest is the precise location they marched their chicks to only one day after hatching. Piping Plover monitors are not dog haters. Many of us are dog owners (some with multiple dogs) and most of us love all animals, wild and domestic. I have, as well as have many of our PiPl advocates, been addressing not only the issue of people not following the leash laws at Good Harbor Beach, but problems around littering and trash collection and how these issues adversely affects Piping Plovers and all wildlife. Before there was the Animal Advisory Committee list of recommendation and the city’s Piping Plover Plan, I presented a list of recommendations, which included how to help the PiPl in regard to littering. This plan was presented on July 9, 2018. We fully recognize the threat gulls and Crows pose to the chicks. The focus of late has been the dogs on the beach because they are the greatest disrupters to courtship and brooding and because the PROBLEM IS STILL NOT RESOLVED, despite the ordinance change. There were dogs off leash all over Good Harbor Beach at the time of this writing (Saturday night) and only a very few gulls and Crows. We recognize that compliance with the ordinance won’t happen overnight, but rather than helping, misinformation is continually spewed. As we have posted many times (including photos of), there are Eastern Coyotes and Red Fox on our local beaches. We see their easily recognized tracks in the sand. But one coyote or one fox, which is the most set of tracks that we ever see on a beach on a given morning at dawn or an evening at dusk, does not in any way equal the disruption to Piping Plovers while they are courting and brooding to that which is caused by several hundred dogs romping on the beach on a single day. ADULT BIRDS ARE NOT IN DANGER OF BEING EATEN BY FOX, COYOTES, AND DOGS BECAUSE THEY CAN FLY AWAY FROM MAMMALIAN PREDATORS. Crane Beach, which has by far many more natural predators than does GHB, successfully fledges chicks every year. 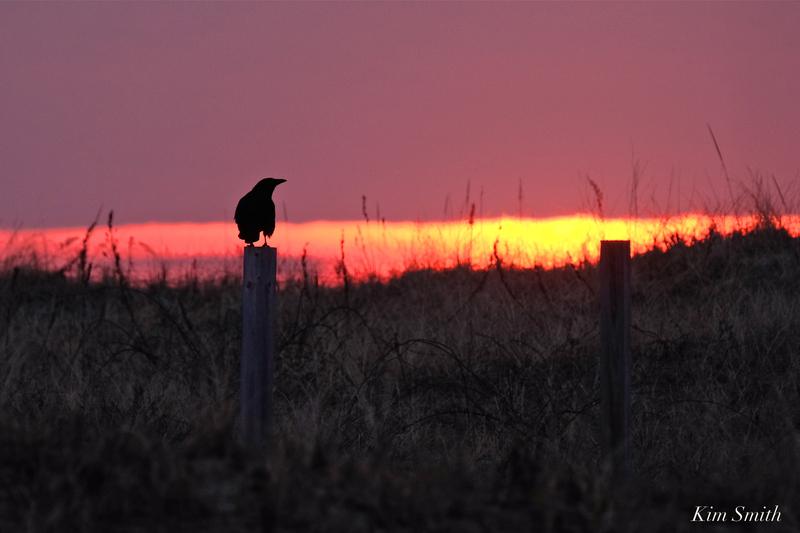 Crow in the dune this morning at daybreak. I have posted often about the problem of gulls, Crows, and litter and how the issue negatively impacts Piping Plovers. ADULT PIPING PLOVERS AND GULLS FEED SIDE BY SIDE ALONG THE SHORELINE. 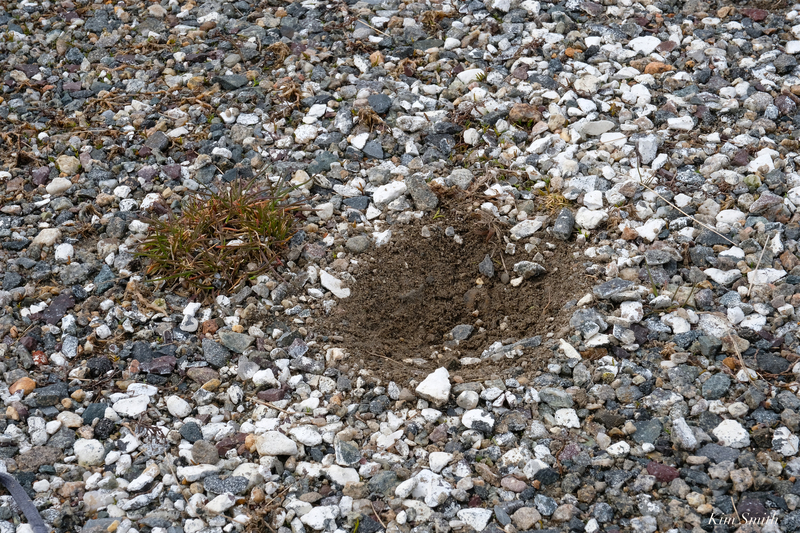 Gulls and Crows threaten Piping Plover chicks, but we are not even at the chick stage yet. 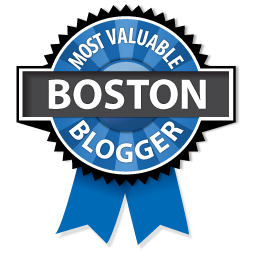 Folks might want to know that because of the restaurants lining the boulevard at Revere Beach, the community has a much, much greater problem with gulls and Crows than we could ever imagine, literally hundreds, if not thousands, on any morning or afternoon. And yet, Revere Beach successfully fledges chicks each year in the exact same locations, and only doors down from where the restaurants are located. 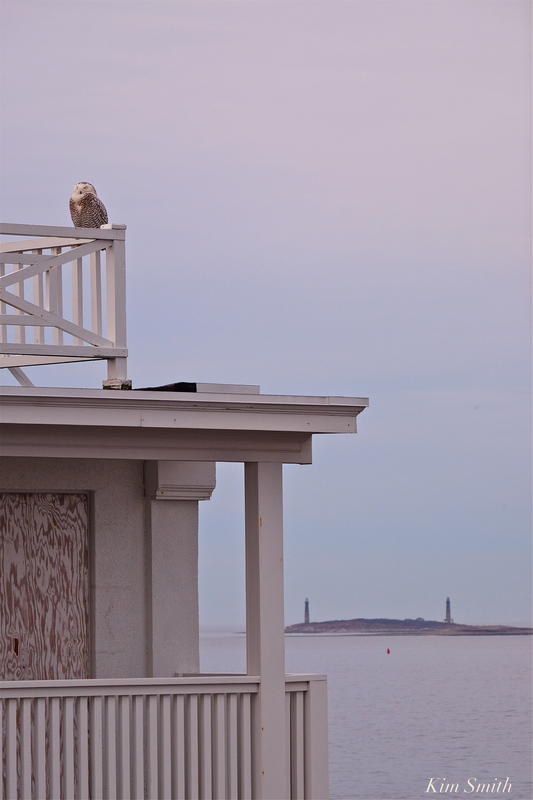 Winthrop Shores Reservation Beach, a densely packed neighborhood with rows upon rows of of triple decker homes facing their beach has a problem with house cats on the beach, and yet this community manages to successfully fledge chicks year in and year out, in the exact same locations. What do these three very different types of beach habitats have in common, and what are these three beach communities doing right that we are not doing? Perhaps it is because the citizens respect their community’s leash laws. Repeatedly claiming disbelief at the number of dogs we are encountering at Good Harbor Beach, I have been pressured and cajoled into sharing photos of dogs on the beach, and when I do, there is public objection on their part. I invite all the negative PiPl Facebook commenters who we NEVER, EVER, EVER see at Good Harbor Beach, to come lend a hand. You were invited to work with us on solving the dogs on the beach issue and our invitation was ignored. Additional note- Today, Sunday, a former off-leash day, there were fewer dogs on the beach than yesterday, a former on-leash day (as of 12pm). Puzzling, but we are not questioning the PiPls good fortune! Huge shout out to ACOs Teagan and Jamie for their hard work, to to all the people who did not bring their dogs to the beach today, to Gloucester’s DPW for installing the unmissable new signs, and to all the folks who came to GHB today, read the signs, and departed (we saw that happen)! Our GHB Piping Plovers are weighing their options. Perhaps if we can keep the dog disturbance to a minimum, they will abandon their nest scrape in the parking lot and stay on the beach. 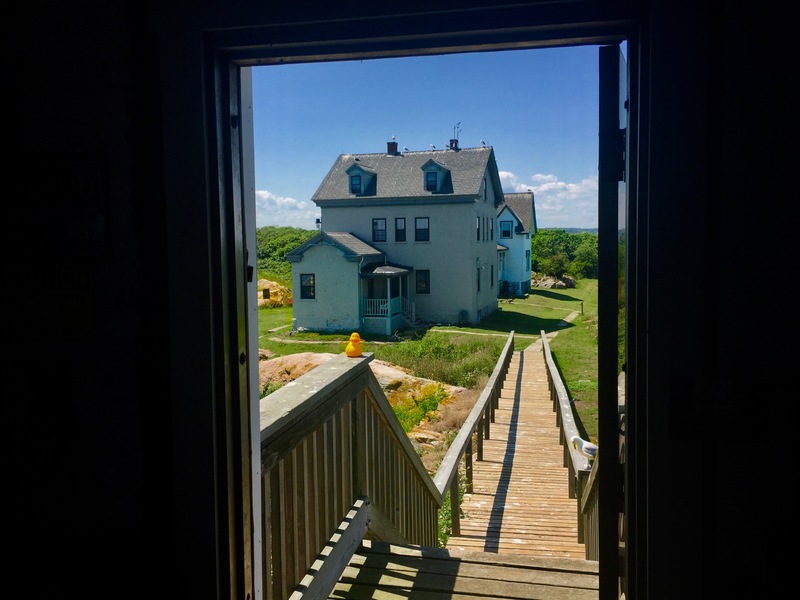 Wonderful Essex County islands IBA #ornithology talk by Chris Leahy | Straightsmouth keeper’s house gets love from Thacher Island Assoc & looks like a scene from Edward Hopper! Esteemed conservationist and bird and insect authority, Chris Leahy discussed recent multi-year surveys of Essex County islands for Mass Audubon and Mass Fish & Wildlife with humor and depth as only he can having resided on the North Shore, in Gloucester, and championed this Important Bird Area for some 50 years. The islands range in size and offer different kinds of nesting habitat. 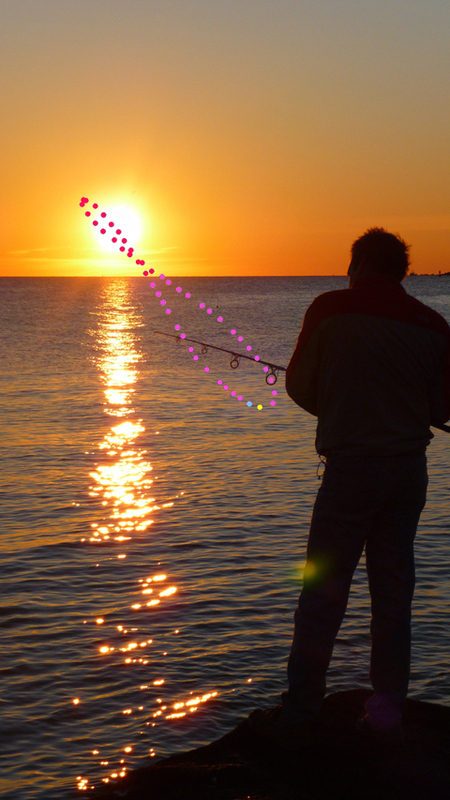 There are great shoals for fishing. Islands include familiar names like Tinkers, Straitsmouth, Thacher, Children’s, Kettle, House, Eagle, Ram, Cormorant and Ten Pound. Leahy recalled visiting some in the 1960s-70s for the first ever field counts with Dorothy “Dottie” Addams Brown, Sarah Fraser Robbins & others, and readily compares data then and now. Climate is partly a factor and population dispersement in the birds they find. Sometimes there are great “fallout” of migratories which are unpredicatable and awesome. Various species are easier to count especially those perched amid low tree shrubs. Guess which ones? Forgot the burrowers! Forecasts are exciting. He predicts we might see Manx shearwters maybe nesting here in the coming years. 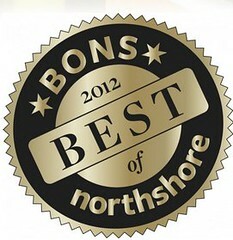 Kindness of organizations and people with boats helps make this happen. And one steel hulled sailboat that makes access to these rocky isles a bit more possible. Chris Leahy presented Treasure Islands for Gloucester Lyceum & Sawyer Free Public Library. 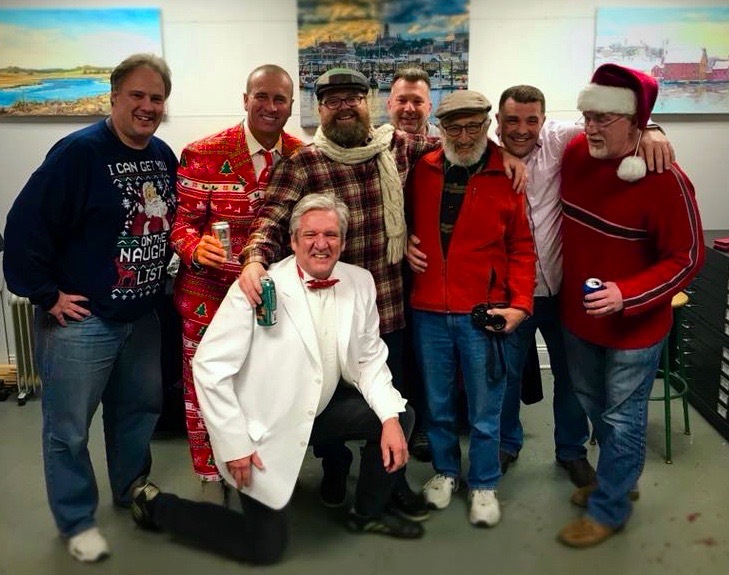 Mary Weissblum has endeavored to host evenings for Leahy’s numerous publications and projects, so many that she’s lost count. “Always a treat to be educated and charmed by his incredible store of knowledge,” she writes. Look for Chris Leahy’s next talk. photos below ©Linda Bosselman Sawyer Free Library- thanks for sharing Linda! A kitesurfer must have amazing athleticism, with an ability to balance on the kiteboard while also controlling the powerful kite. And withstand Gloucester’s current 36 degree water temperature. 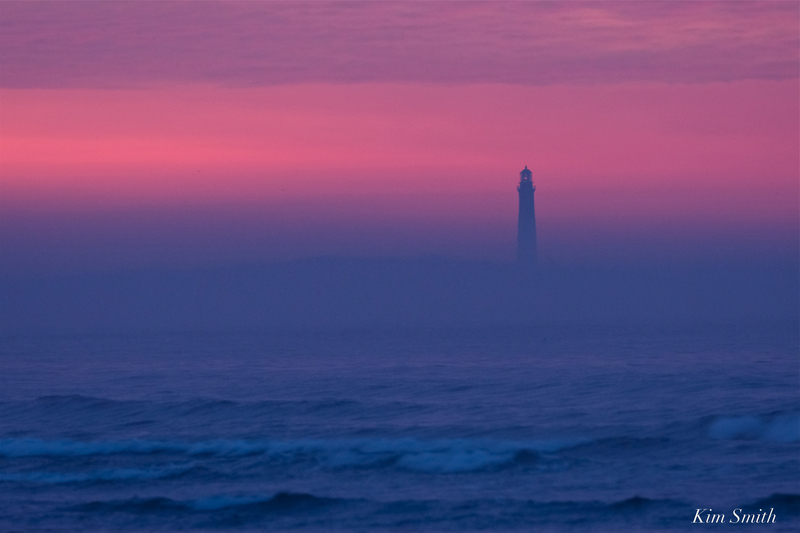 Hoping to capture the Supermoon, in all its huge glory, rising between the Twin Lights last night, but the sky was pink and hazy around the horizon line. Still, I think it’s good to have a record of a rarely occurring full moon on the first day of spring. 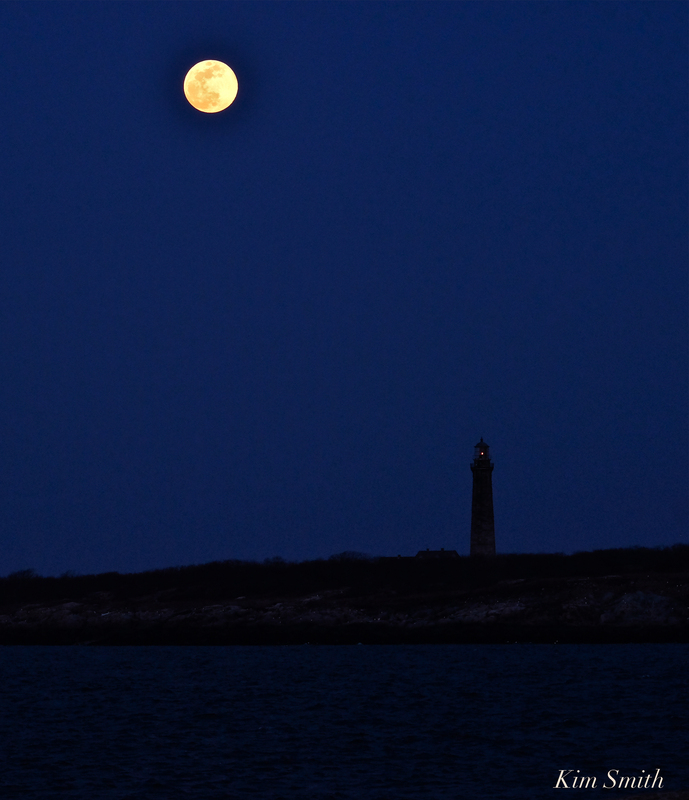 Thacher Island Twin Lights, waiting for the Moon to rise, North Light, left; South Light right. Snapshots from a brief tour around the back shore while out doing errands this afternoon. 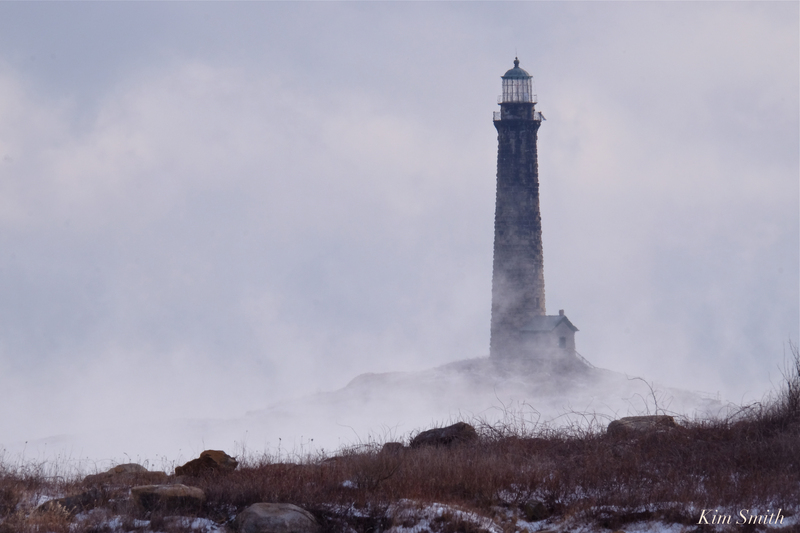 With temperatures hovering at 5 degrees, Cape Ann was blanketed with a thick layer of impenetrable ice, snow squalls, and sea smoke. Happy to see the temperatures are heading towards the forties after Tuesday! 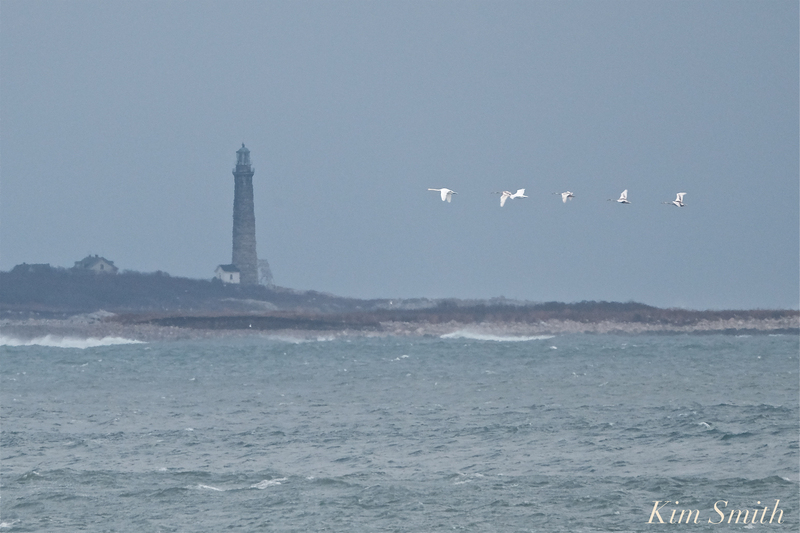 THRILLING TO SEE SWANS FLYING OVER THE TWIN LIGHTHOUSES! Friday afternoon, after the nor’easter, the sun came out just barely before the skies again darkened with a brief snow squall. 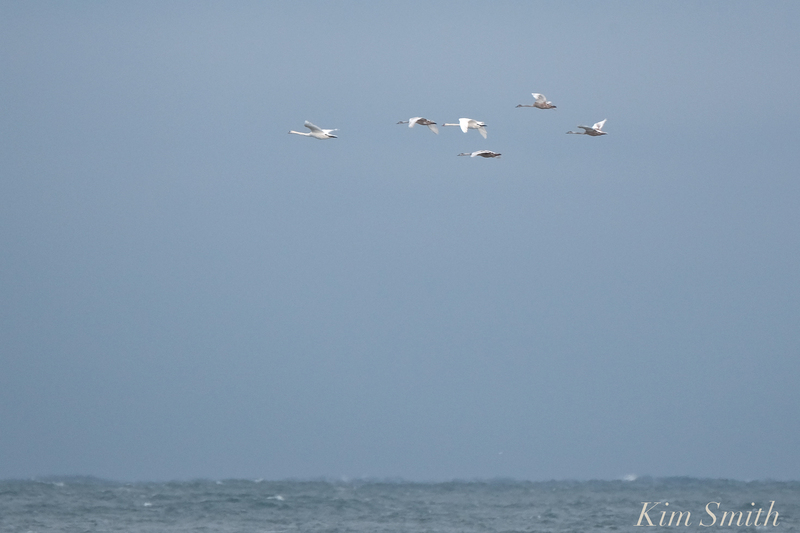 I was driving along Atlantic Road during those fleeting in between moments when way off in the distance I spied a flock of birds, with the distinct shape of swans in flight. Swans fly with their long necks extended, unlike herons and egrets, which fly with their necks tucked in. What is Mr. Swan doing out in this wildly windy weather I thought. But it wasn’t Mr. Swan, it was an entire family of Swans! There were two adults and four cygnets. Stunning to see and very uplifting. They flew over the Twin Lights and then further and further until I could not see them any longer. The first and third swans are the adults, the second, fourth, fifth and sixth are the cygnets, or first-hatch year juveniles.The young swans will retain their grayish brown feathers until their second summer. Please write and let me know if you saw the Mute Swan family on Friday afternoon. 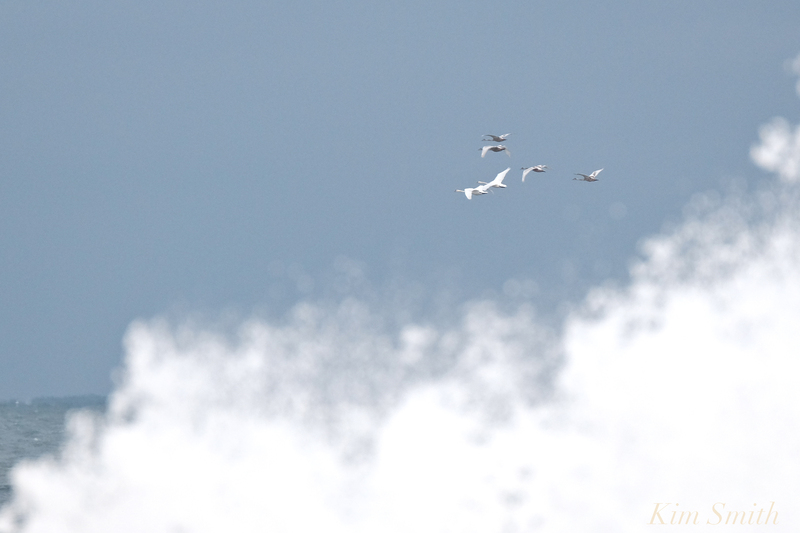 They were flying along the backshore at about 2:15. Or, if you live on the Northshore and know of any swan family with two adults and four youngsters, I would love to learn more about them. My email address is kimsmithdesigns@hotmail.com. Thank you so much for any leads! 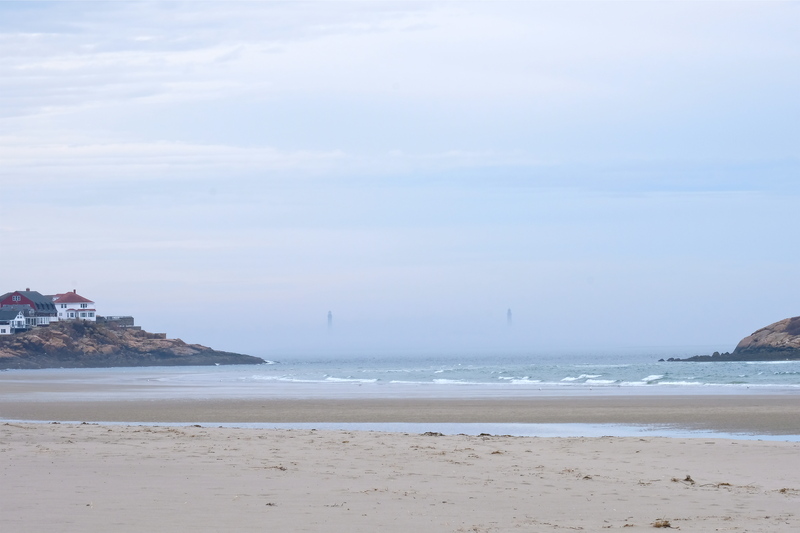 There are six lighthouses on Cape Ann, plus one more imaginative one at Stage Fort Park’s dynamite playground. Recently I hosted a large group visiting from Arizona. They wanted to walk a local history trail and ended up visiting two: the Freedom Trail in Boston and the HarborWalk in Gloucester. 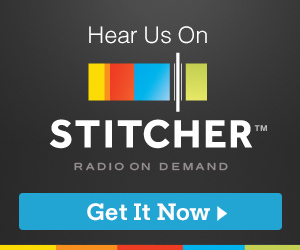 Their number one request? They wanted to see lighthouses. 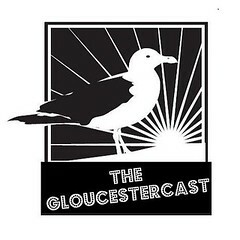 Last year, Kathie Gilson and Marie Santos designed this fun shaped brochure for the City of Gloucester. 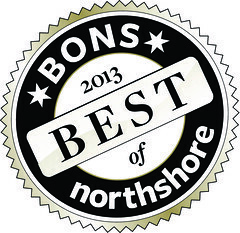 You can find it at the Chamber and the Stage Fort Park welcome center. 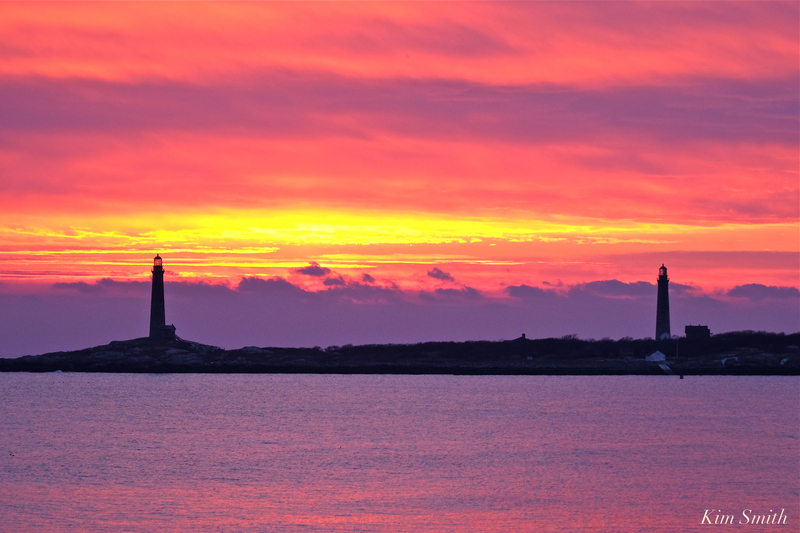 Cape Ann Harbor Tours offers special Lighthouse Cruise all along Cape Ann as well as harbor tours. 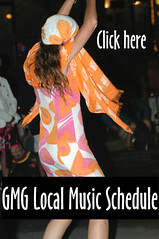 (978) 283-1979 Email info@capeannharbortours.com. 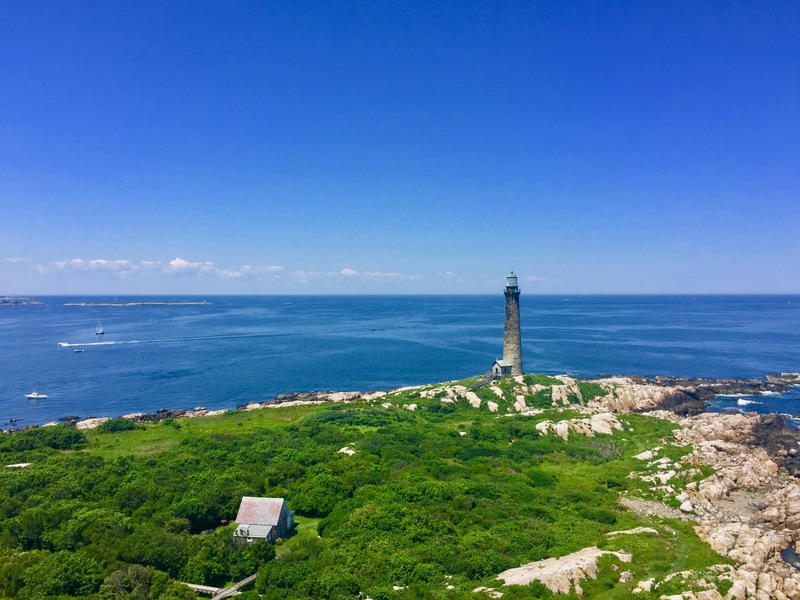 GREAT NEWS FOR STRAITSMOUTH ISLAND AND CONGRATULATIONS TO PAUL ST. GERMAIN AND THACHER ISLAND ASSOCIATION!! 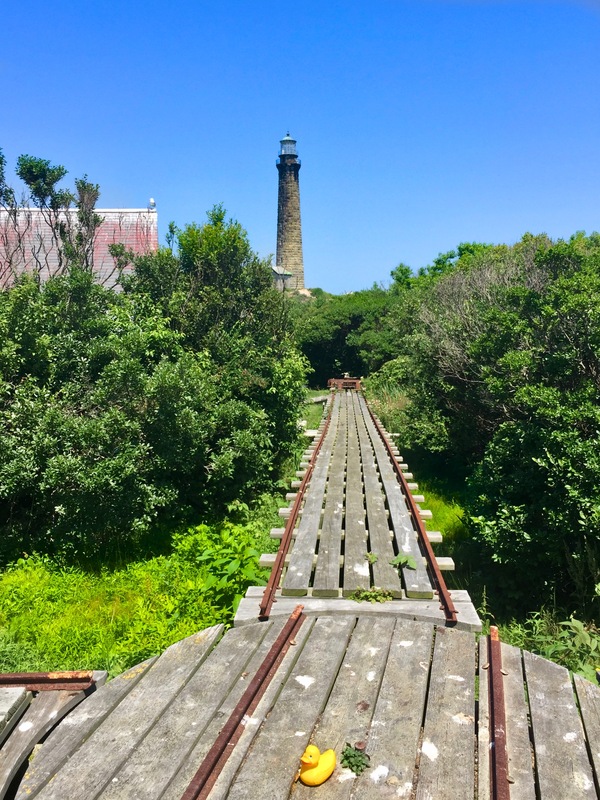 A huge shout out to Thacher Island Association and president Paul St. Germain for winning an Essex National Heritage Area partnership grant to restore the elevated pedestrian lighthouse walkway on Straitsmouth Island. This unique 1906 photo shows the 315-foot walkway, the oil house, and keeper house, as well as Thacher Island’s Twin Lights in the distance. 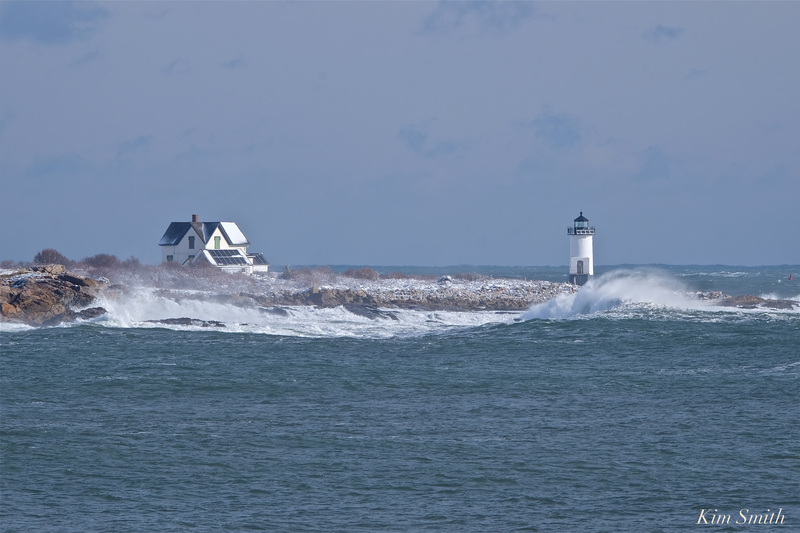 First lighthouse was established in 1835 to mark the entrance to Rockport Harbor. 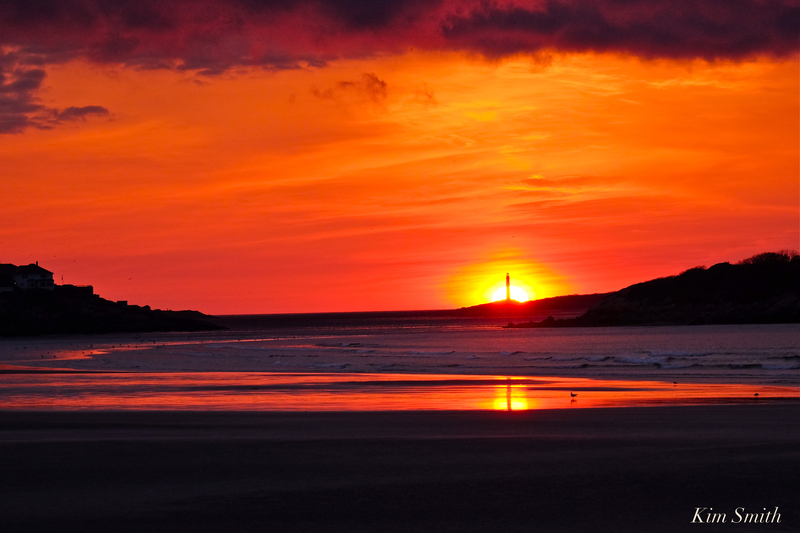 The lighthouse was rebuilt in 1851 and again in 1896. A 6th order Fresnel lens was installed in the lantern in 1857. The current Victorian styled keeper house was built in 1878 similar to the one on Thacher Island. In 1932 the light was converted from white to green. Coast Guard moved the station to shore at Gap Head and sold the island to private parties in 1934. Coast Guard continues to maintain the light as an official aid to navigation today. 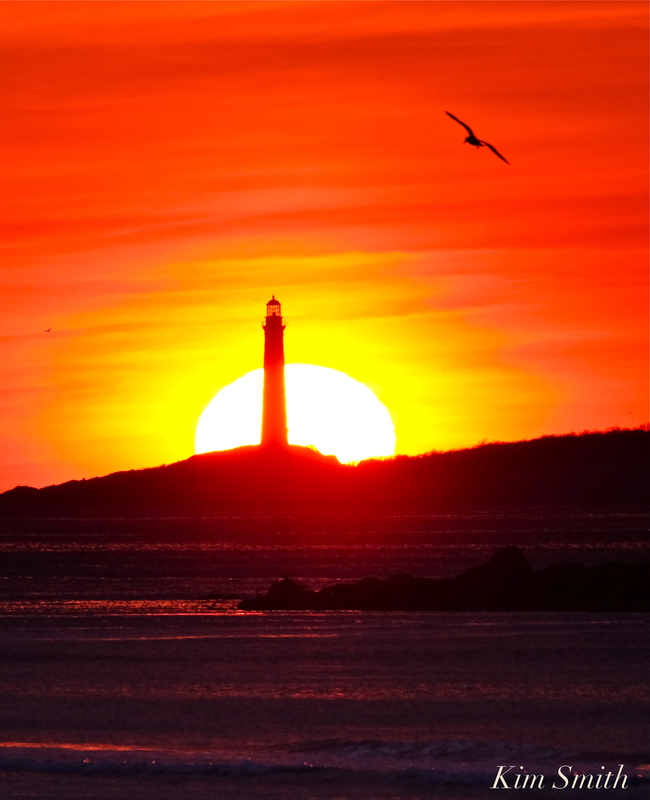 In 1967 the island (except for the lighthouse) was donated to Massachusetts Audubon Society who maintains it as a wildlife sanctuary. Straitsmouth Island was listed on the National Register of Historic Places in 1987. 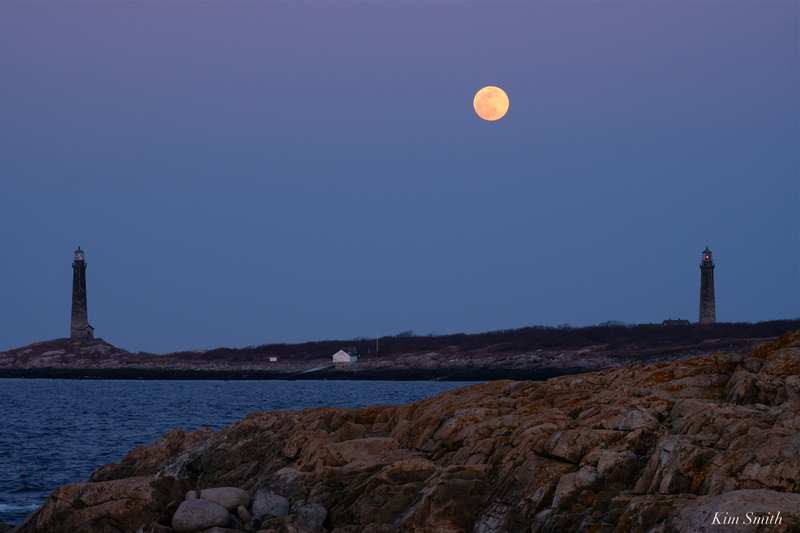 In 2010 the lighthouse and 1.8 acres of land was given to the Town of Rockport by the coast guard. In 2014 the Town of Rockport signed a long term 30 year lease with Mass Audubon for the use of the keeper and oil houses. 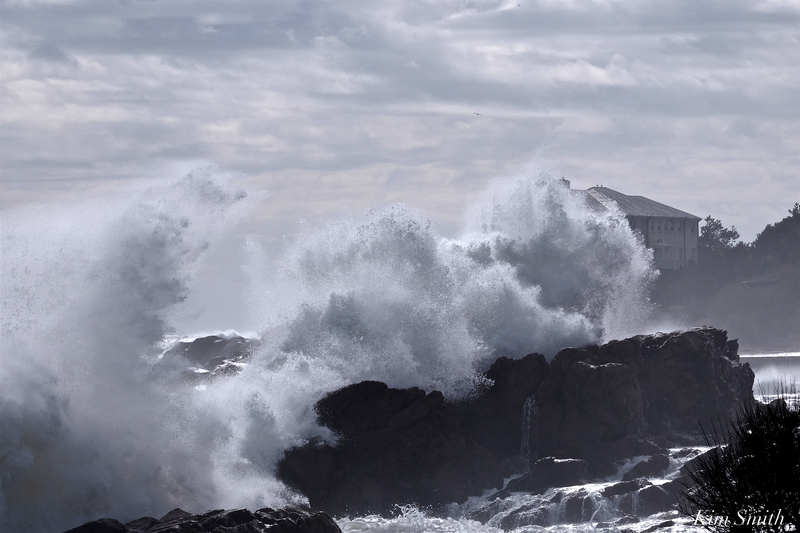 The best wave watching Sunday afternoon was from Atlantic Road, especially when the light turned silver-gray-violet. 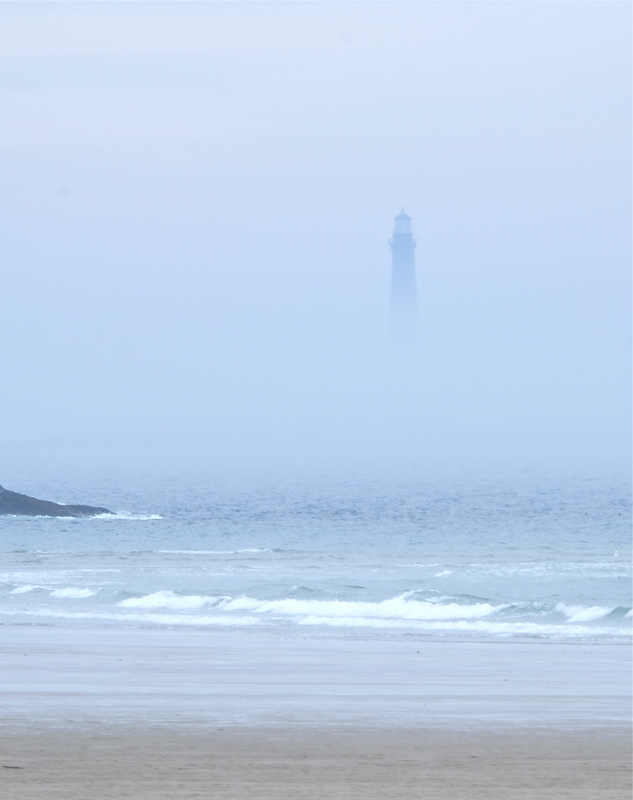 The mist from the pounding waves filled the air, creating a beautiful diffused quality. 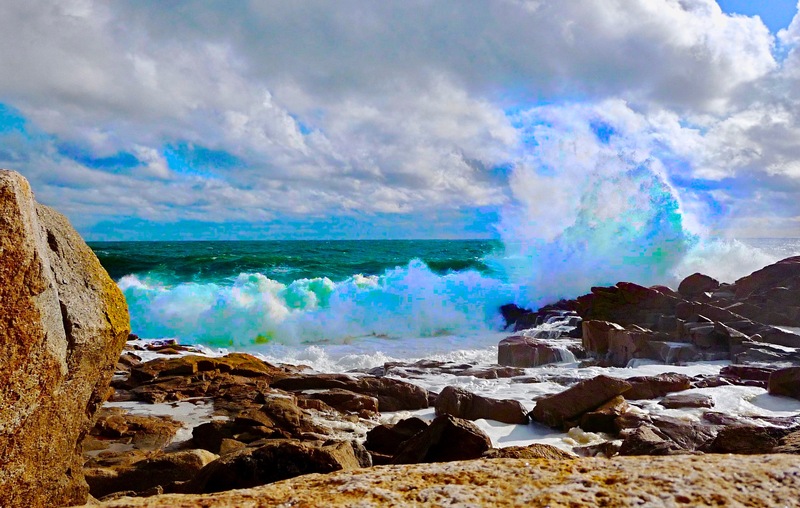 It was mesmerizing to see the waves hurling against the rocky coastline. Often the force was so loud, it sounded like a sonic boom had exploded. Atlantic Road was closed to car traffic while pedestrians strolled the road as though a promenade. 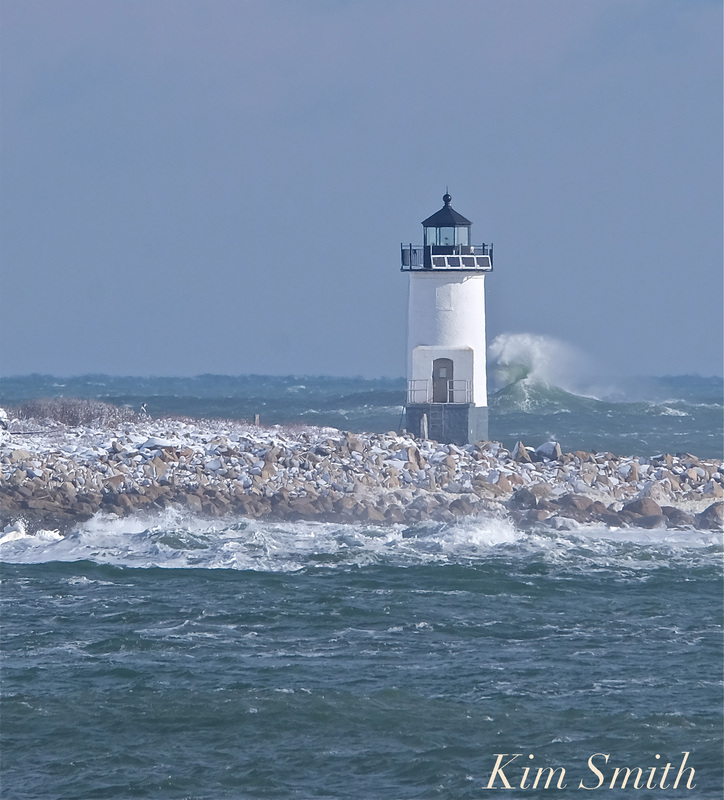 After watching the full force of the waves during high tide, I headed over to Straitsmouth Island in Rockport. Less in strength, but still spectacular to watch. 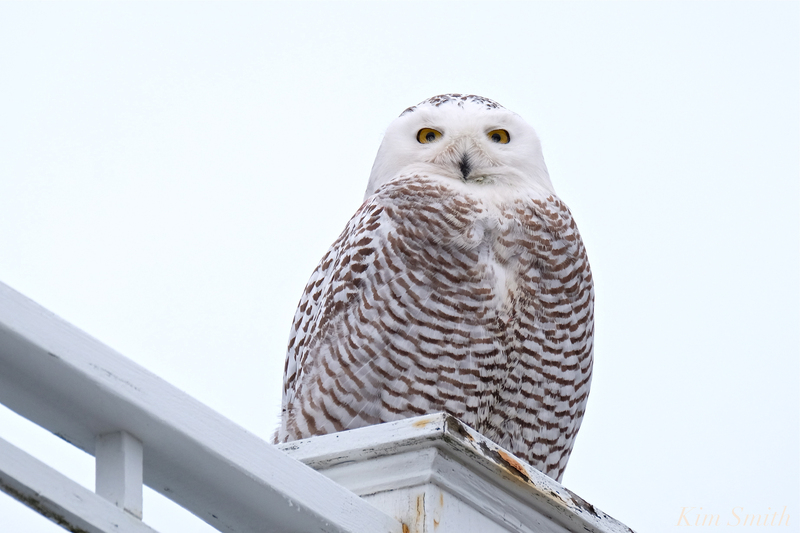 Hedwig was observed Saturday morning, when repeated harassment by a flock of crows sent her hiding. She reappeared Saturday afternoon, and was again seen Sunday morning in the drizzle, not too far from where she was perched Saturday evening. Later Sunday afternoon she slept and rested in the pouring rain. That she stays in a highly localized winter territory seems in keeping with known Snowy Owl behavior traits. 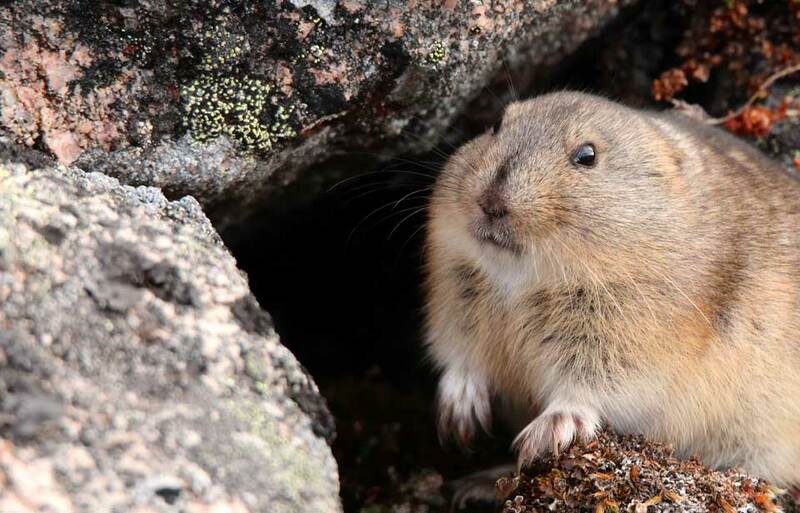 I read that during the summer season in the Arctic, male Snowies hunt over hundreds of miles, whereas female Snowies typically hunt within a much smaller range. She has been observed eating sea ducks and rabbits and there are plenty of rat holes along the backshore rocks. 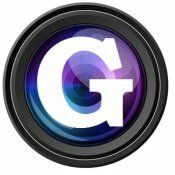 Great info and thanks to Paul for sharing that! 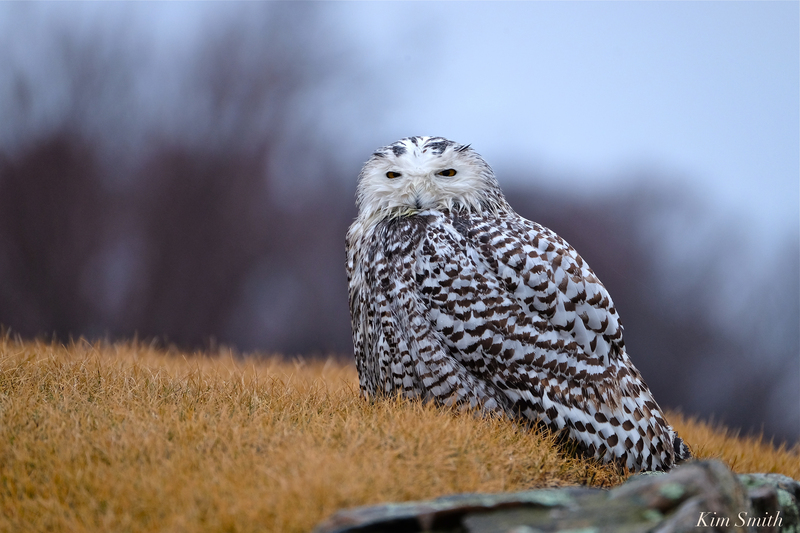 A Snowy Owl has been seen on the rocks in Rockport, across the strait, opposite Twin Lights, and wonder if it is our Hedwig. This brings up the topic, what to do if you have a rat problem. 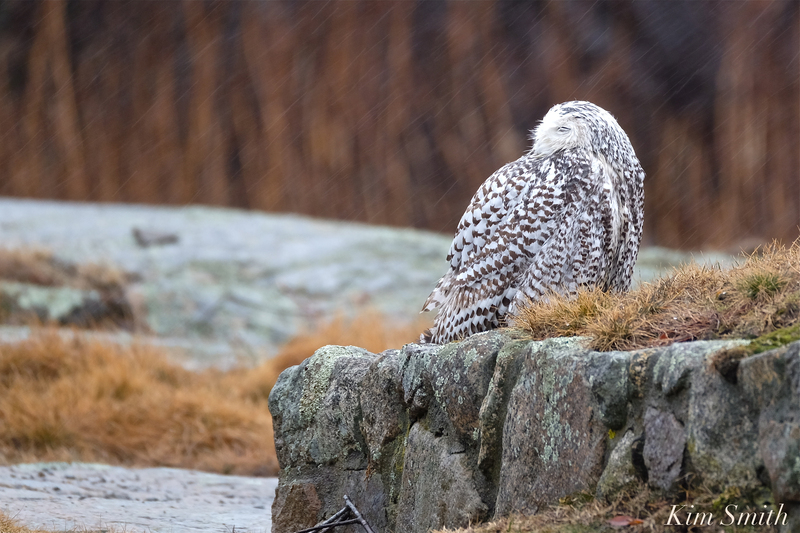 The absolute worst way to control rats is with rat poison, namely for the sake of beautiful predatory birds such as Snowy Owls, falcons, hawks, and eagles. Birds that ingest rats that have been poisoned with rat poison will generally become gravely ill and die. Secondly, it is a cruel, slow death for the rat. They will usually go back to their nest to die. If that nest is located behind a wall in your home, you will smell that unmistakeable horrendous smell for many months. Thirdly, rat poison is only 60 percent effective. I wonder if the rats that survive rat poison will go on to breed super rats. The best way to avoid having to kill a rat is to make sure they cannot gain access to your home or business by regularly inspecting soffits and woodwork for holes. 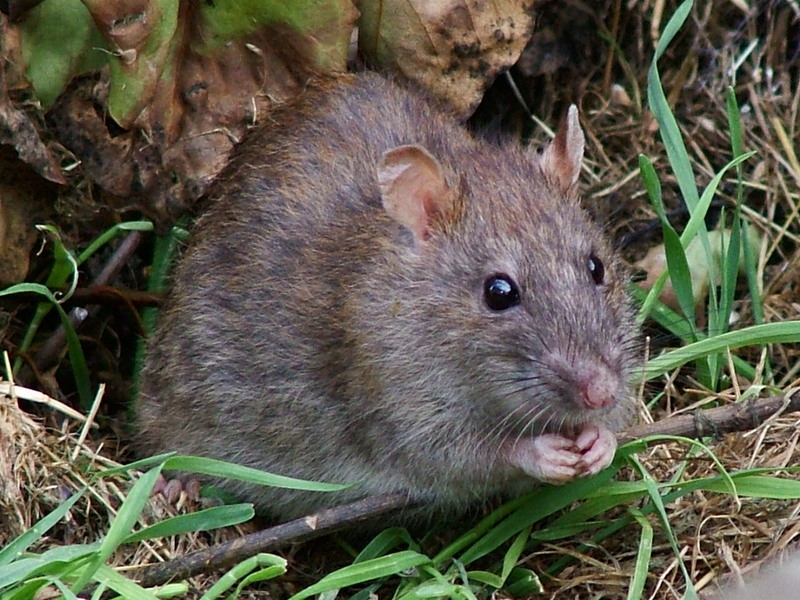 Old-fashioned snap traps and live trapping continue to be the most effective way to rid your home or business of rats. Saturday I stopped to say hello to a group of birders flocked together along the backshore who had traveled all the way from western Mass. They were observing Grebes, Buffleheads, and a Common Murre. And a Puffin had been spotted! I asked if they were planning to go to any of our local restaurants for lunch, but they had packed lunches. 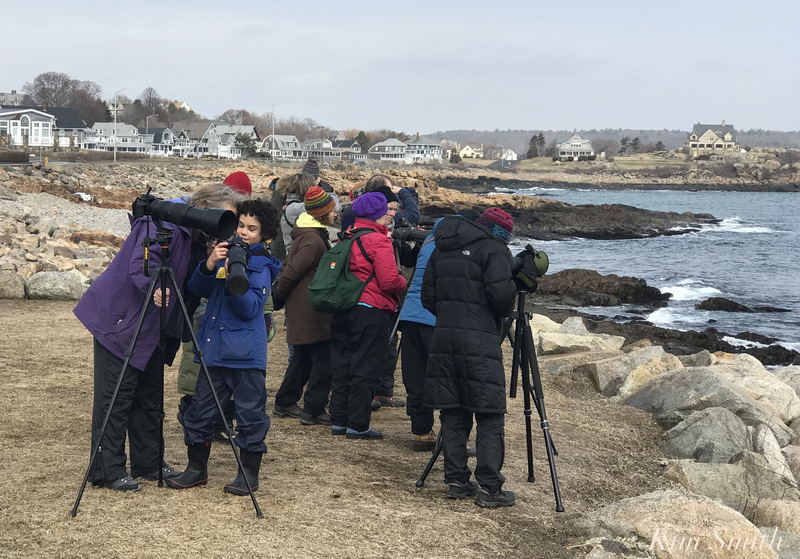 One Mom shared that an expert from Audubon told the group that there were at least a “dozen Snowy Owls” on Bass Rocks. Bananas! I have to say that it makes me hoppin’ mad when folks spread misinformation about our local wildlife. I gently told her that no, there were not a dozen owls, but that if she and her group waited until late afternoon, they might catch sight of Hedwig. 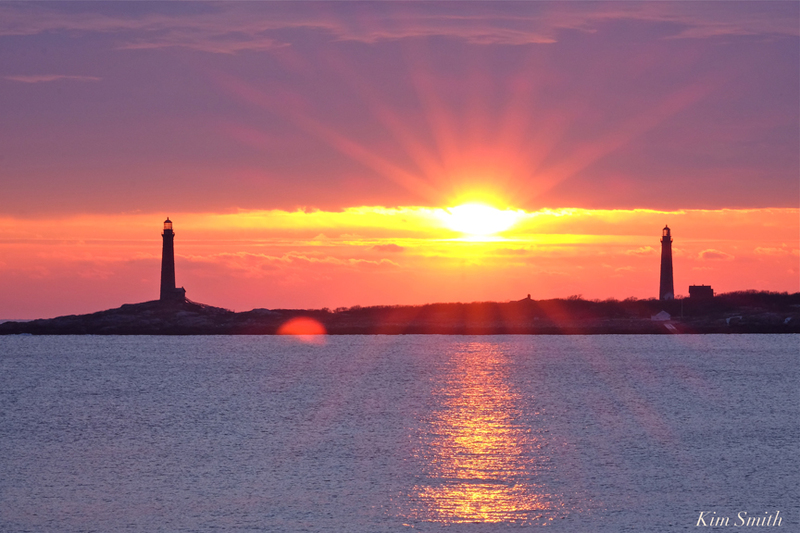 GLORIOUS GOOD MORNING BROUGHT TO YOU BY TWIN LIGHTS! 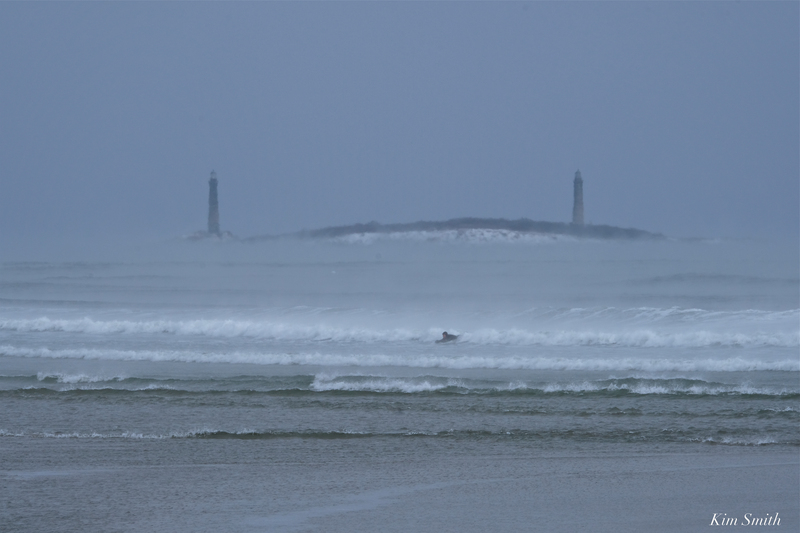 Evocative views looking through sea smoke along the shoreline this morning, from Ten Pound Island to Twin Lights, and at every vantage point along the way. On my very last stop photographing a buoy in the sea smoke, I spied a mystery bird far off shore. Bobbing in the water and with a bill not at all shaped liked a seagulls, it was a SNOW GOOSE! He was too far away to get a great photo, but wonderful to see nonetheless! David Cox got after me at the Christmas party I was not posting enough and goodness, a month has practically gone by since my last photo. So instead of posting my annual analemma shot for Winter Solstice, and wish everyone a Happy Festivus, I’ll post some pics from the other end of the analemma. 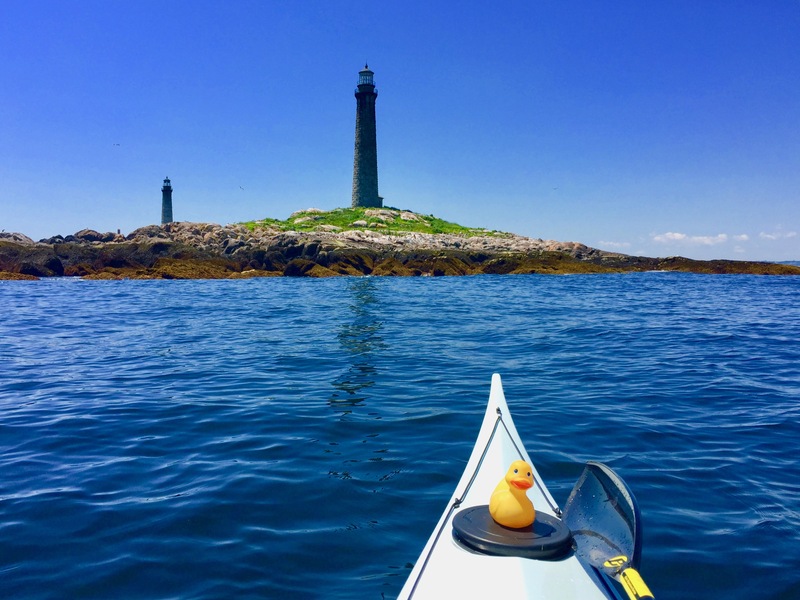 When Thacher Island is a hot paddle in July. 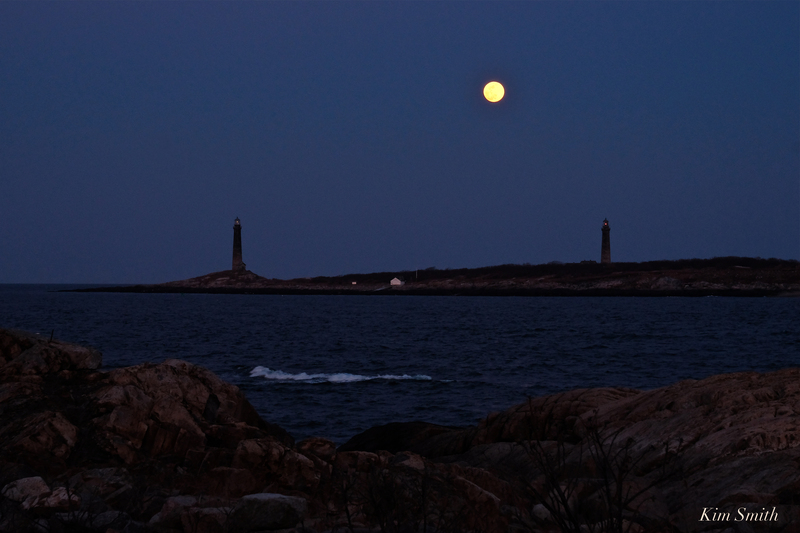 Six lighthouses on Cape Ann to choose from but these two are my favorite. If you ever played the Computer game Myst popular in 1993 you know that the Miller brothers had to have visited Thacher Island. Except in Myst, there were zip lines between the lighthouses. Rockport should install them. 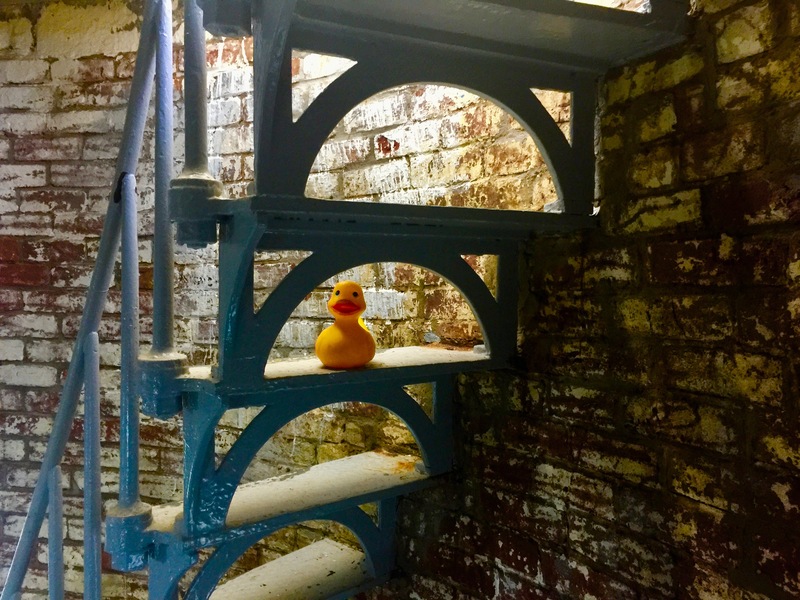 Rubber Duck wanted to say hello to the sixty seagulls lining the rail. Only Homie stuck around. I quack myself up. OK, I’ll stick to photos. Here is the analemma. Today on the winter sostice we are the yellow ball. The blue ball of course denotes when certain people who do not chicken out jump into Gloucester Harbor.